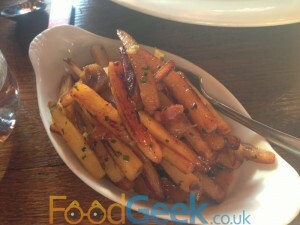 After drinking a little too much wine at The Fat Duck the previous night I wondered if I was really up to a big lunch. 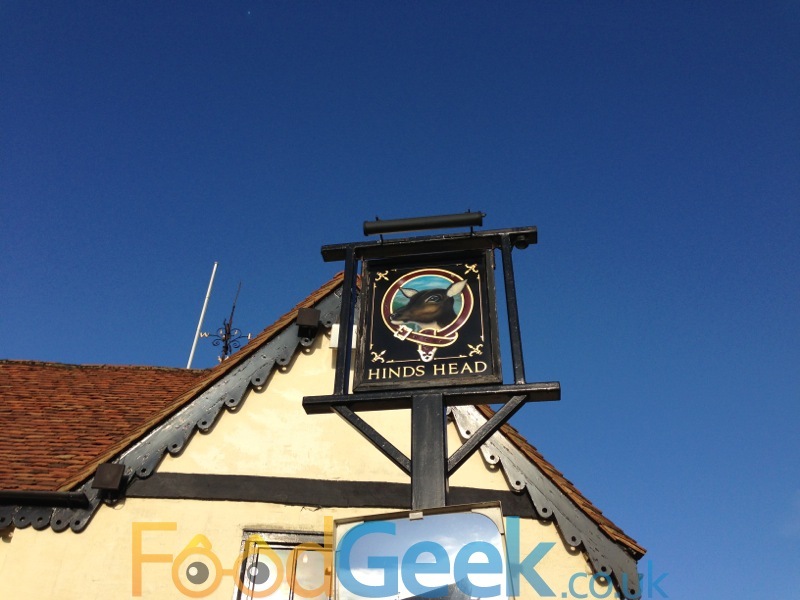 I decided it would be crazy to leave Bray without eating at Heston’s Michelin starred pub The Hinds Head so went along anyway and i’m so glad that I did. I’d already had a couple of drinks in there the previous night so knew what to expect inside although it was a very different place then, with it’s bustling bar it felt much more like a real pub than a restaurant. This time though the bar was fairly empty as we made our way through to the restaurant side. 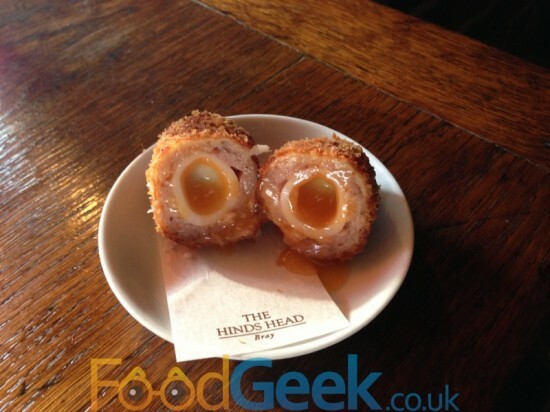 We started with a couple of bar snacks, ‘Devils On Horseback’ and a Scotch Egg, perhaps one of Heston’s most famous recipes. I’d gotten my Angels & Devils mixed up and was expecting an oyster wrapped in bacon so was a little surprised when it turned out to be a date under the bacon. I don’t really like dates. I did quite like this though, not as much as I’d have liked an ‘Angel On Horseback’ admittedly but there was something about the sweet jammy texture of the date combined with crispy, smokey bacon that I enjoyed. 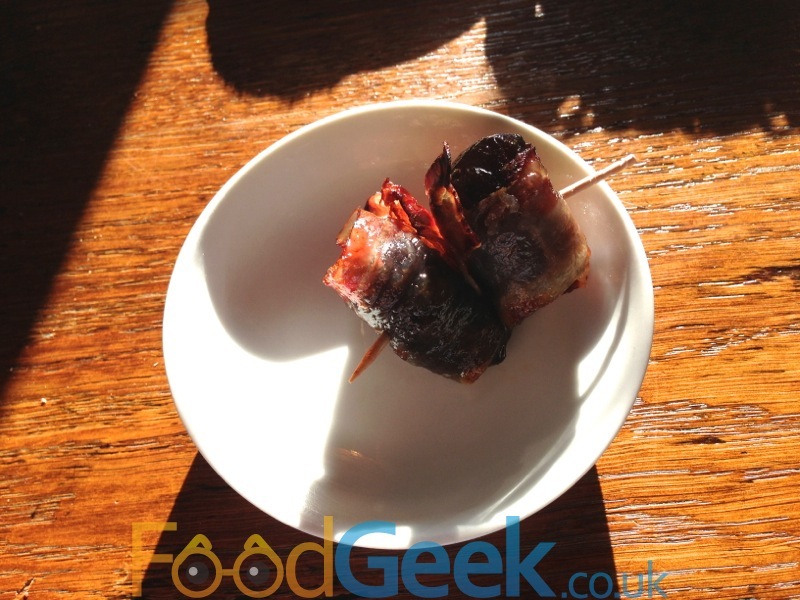 Maybe it just proves that anything will taste good wrapped in bacon? The scotch egg was stunning, perfectly round, crispy and golden on the outside but the best bit was yet to come. Cutting into it revealed a layer of delicious sausage meat encasing a perfectly cooked quails egg, the soft runny yolk that Heston worked so hard to achieve and has since been copied by restaurants everywhere oozed all over the plate. A delight to eat and an absolute bargain. For my main starter I picked ‘Hash Of Snails’, after being wowed by Snail Porridge at The Fat Duck I hoped this dish would be as good. It was. It was a brilliant balance of contrasting textures. 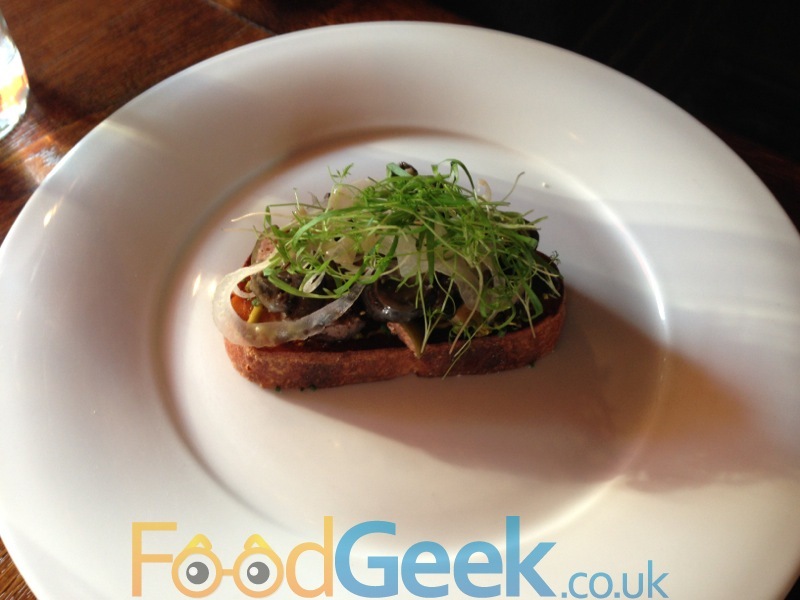 The crunchy sourdough toast topped with soft buttery snails, slices of fennel, onion and herbs. It packed incredible flavour too, though they were very carefully balanced. A really good dish in every way. My partner (with a little helpful persuading from me) went for the ‘Soused Mackerel with Cucumber, Pickled Lemon and Horseradish’. As good as my Snails were, this was even better. The quality of the Mackerel was exceptional, as good a piece of fish as i’ve ever encountered. It was all about the clever balance of flavours again though. 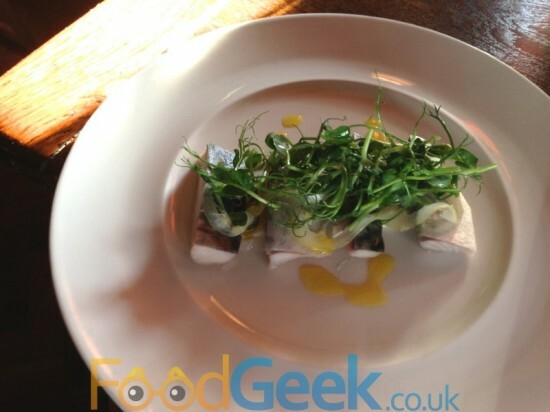 The mackerel was sitting on top of thin slices of pickled lemon which added a lovely sharpness to cut through the fish whilst the horseradish brought heat and the cucumber cooled everything down again. Simply a stunning dish. For main course I went for ‘Oxtail and Kidney Pudding’ which I’ve heard Heston describe as his favourite ever recipe, it was also very good. 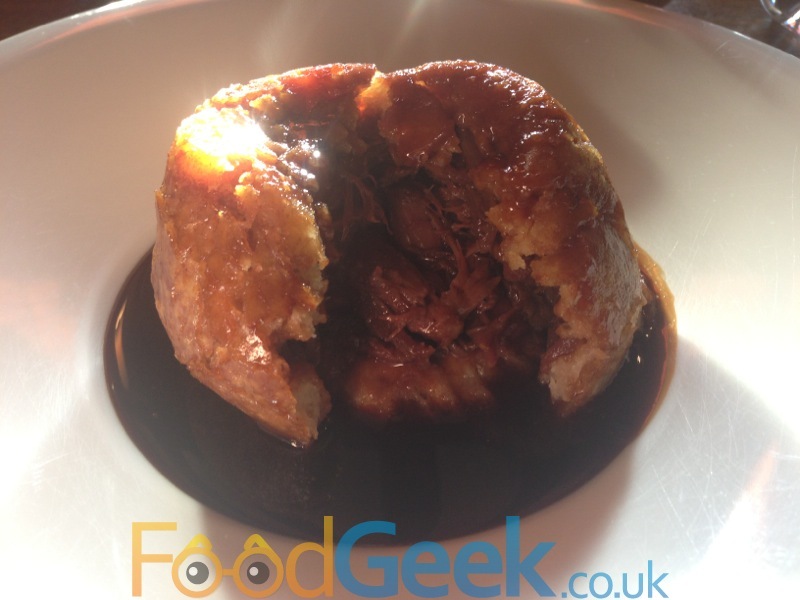 Soft, thick suet pastry which when opened up revealed a generous amount of sumptuous slow cooked oxtail and well cooked kidneys and loads of the richest, meatiest gravy. A really hearty and tasty dish, perfect hangover cure. Mrs FoodGeek’s ‘Wild Mushroom Macaroni with Slow Cooked Hen Egg’ felt a little healthier but was just as good comfort food. 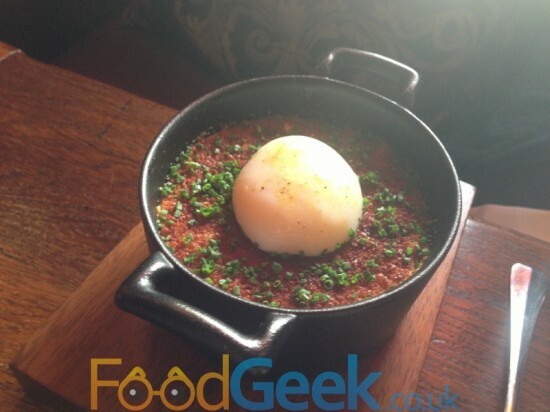 Another clever combination of textures and flavours, the soft macaroni in the meaty, oozy mushroom sauce topped with a crunchy gratin was delicious and was made even better by the slow cooked hen egg which released warm, creamy, runny yolk into the dish. Another joy to eat. 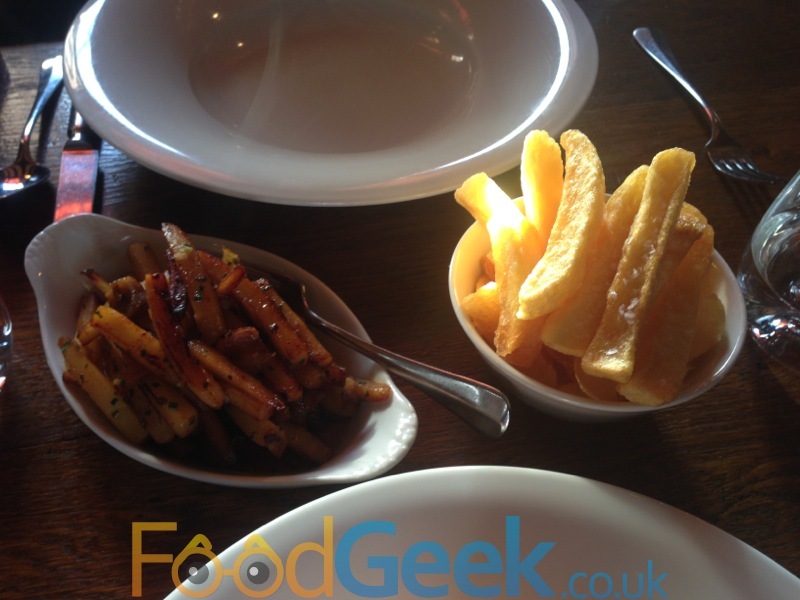 We really didn’t need them but we also ordered a couple of sides, ‘Roast Parsnips with Chestnuts and Bacon’ as we were feeling festive and of course ‘Triple Cooked Chips’, another recipe that has been copied by so many chefs. I was annoyed when visiting Dinner By Heston earlier this year that they’re not available to buy as a side (they only come with steaks) so I had to try them here. 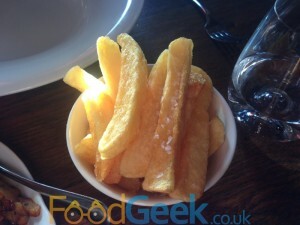 I have made them myself many times using Heston’s recipe and always been impressed but these were on another level, I fear i’ll never enjoy another chip again. The photo seriously does not do justice to how incredibly crispy and crunchy they are on the outside yet the inside is light and fluffy. Perfectly seasoned they were so good that we demolished them in minutes despite being really quite full. 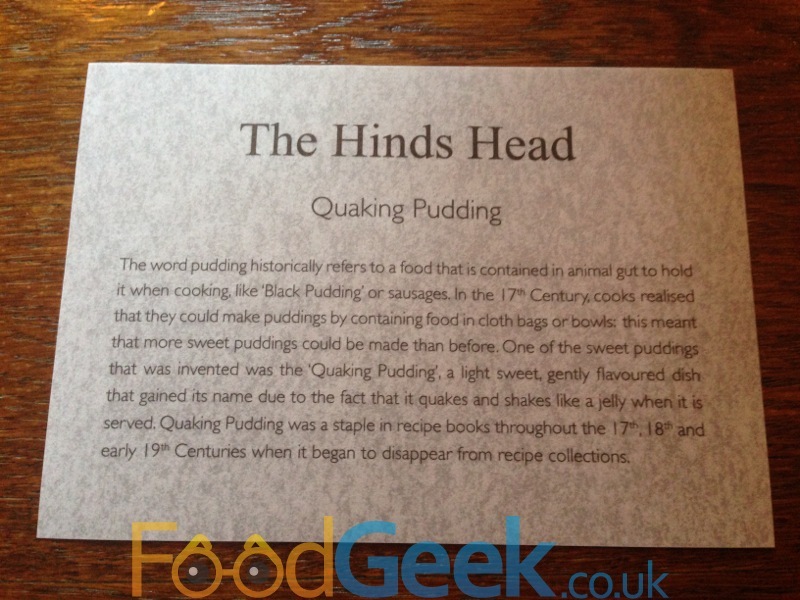 Shortly before my dessert arrived I was presented with a little card telling the history and story of the Quaking Pudding i’d ordered. A nice touch which I also encountered at Dinner & The Fat Duck and definitely increases the interest and anticipation of the forthcoming dish. The ‘Malted Barley Quaking Pudding’ smelt delicious, a bit like porridge. 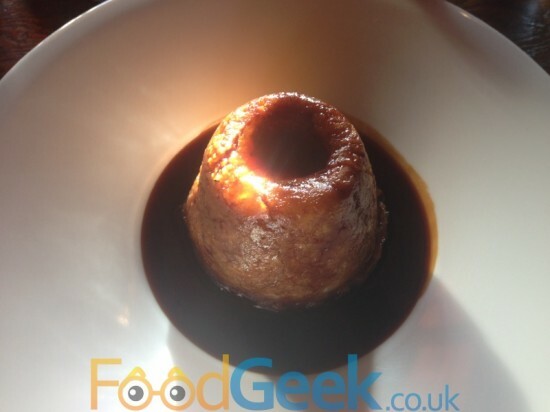 It had a great wobble as good as any panna cotta and tasted like a warm creme brûlée. It tasted amazing but the best thing about it was how incredibly light it felt. The mini malted biscuits topped with cream on the side were a delicious mouthful of flavours of their own too. 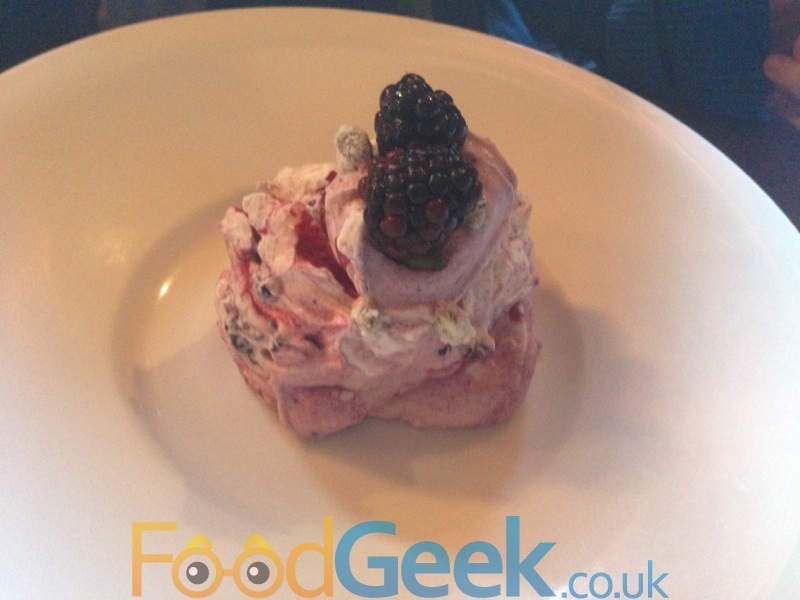 Mrs FG picked ‘A Mess of Blackberries’, a more Autumnal version of an Eton Mess with a few little surprises. The surprises being fennel and candied pistachios which added really interesting flavour and texture to the cream and meringue. Not as good as my Quaking Pudding but an excellent dessert. By this point we were close to exploding and really shouldn’t have eaten another thing but when we were presented with 2 small cubes of chocolate truffle with our coffee we couldn’t resist. They were small but very rich with a deep intense dark chocolate and orange flavour. As you may be able to tell, I really, really like The Hinds Head. 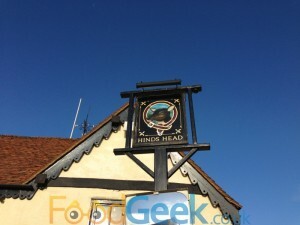 It’s a brilliant pub and an even better restaurant. It must be the best genuine ‘pub food’ in the country, I know The Hand & Flowers has 2 stars and is serving up brilliant food but I really don’t consider that to be pub food. This is, it just happens to be phenomenal quality. Service was unfussy but very friendly, efficient and fast. We got through our snacks, 3 courses, sides and coffee in well under 90minutes which we greatly appreciated before our long drive home. I’m already planning when I can go back. 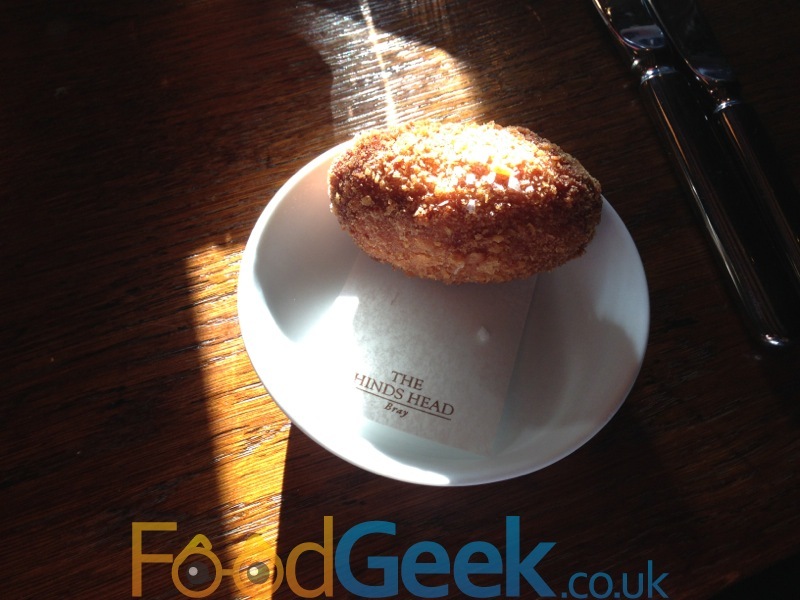 As if I needed anymore evidence that The Hinds Head is a special place we were also eating with culinary royalty as legend Michel Roux Sr was seated at the next table. 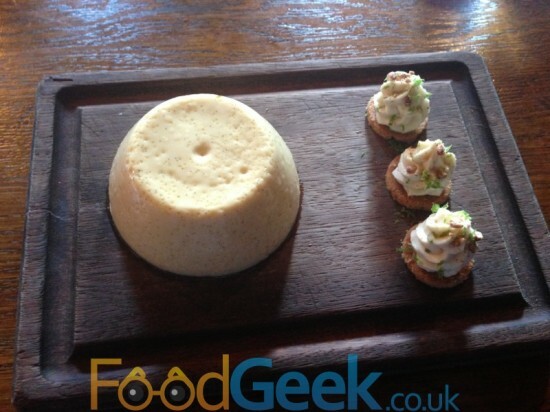 Mrs FG was very impressed when he received the Macaroni main course that she’d ordered. I would have loved to stay around to see what he had for desert but we had rush hour traffic to avoid so i’ll never know.